Your kitchen is a truly important space in your home. Not only does it provide you with a place to cook delicious meals, it serves as an incredibly social space where you, your family, and friends all come together. Your kitchen should be both beautiful and functional to ensure you have the kitchen of your dreams. If your kitchen is small, it may make it difficult to cook, especially if you have a large family. 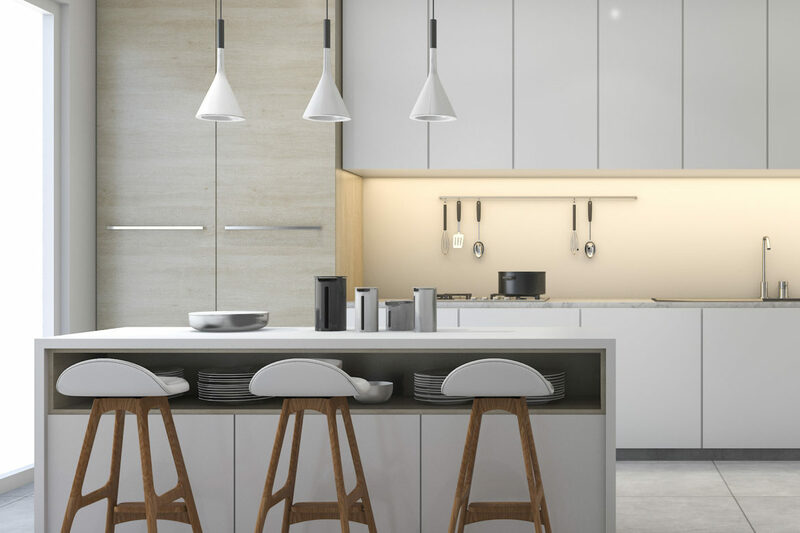 Some homeowners with a small kitchen look to change up their kitchen design and expand their kitchen in their next renovation project, often by knocking down a wall for a more open floor plan or by expanding a little into the living area. However, this is not always an option. Whether you have no extra room to work with or do not want to take any space away from the rest of your home, there are a few things you can do to maximize your small kitchen’s potential. The arrangement of your kitchen’s counters, cabinets, and appliances can make all the difference between a kitchen that’s too small to cook in and a space you love. There are certain kitchen layouts that are better suited for less square footage. In a galley kitchen, countertops, appliances, and cabinets are lined up against two walls facing each other with space down the middle of the kitchen for walking room. Pullman or one-wall kitchens have all kitchen features and necessities arranged on one single wall, crucial for incredibly small spaces. Your kitchen remodeling company can help you determine the right layout that will maximize your space. A great way to take advantage of a small kitchen is to think vertically! Do not worry that you have less horizontal space and instead focus on how you can use vertical space. Install more hanging cabinets for additional storage. Purchase a wall-hanging microwave and position it over your stove to free up your countertops. Hang cooking utensils like spoons and spatulas on hooks next to your oven for easy access. Think creatively use your walls in your kitchen design to free up your floor space. No kitchen can have too much storage. Make sure your counters also have cabinet drawers to store cleaning supplies, trash bags, Tupperware, or whatever else you prefer to have easily available below. Install more hanging cabinets for more overhead storage for your plates, cups, bowls, and other dishes. If you need more storage room versus cooking area, consider sacrificing a little bit of counter space to install a floor-to-ceiling built-in kitchen pantry to hold your groceries that do not require refrigeration. As for your cold and frozen goods, invest in a refrigerator with multiple drawers and innovative storage. For Northern Virginia Kitchen Design, Contact Craft Master Home Design! Craft Master Home Design, a kitchen remodeling company in Northern Virginia, offers kitchen design services. We are dedicated to helping you create a kitchen that meets both your aesthetic and functional needs. We go above and beyond to meet your goals at every step of the process, and we make your satisfaction our priority. To begin your kitchen remodeling project, contact us now!